Action potentials in ventricular myocytes trigger the Ca2+ entry that is necessary for their contraction. Their synchronicity, characteristic shape and length safeguards the heart against abnormal electrical activity. When these safeguards go wrong it can be potentially life threatening. In this article we will look at how action potentials spread in ventricular cells, their shape and modulation in disease states. When the connexons of two adjacent cells come together they can form a channel which allows the cytosol of these cells to mix. In this way ions can easily pass from cell to cell and the cells are said to be electrically coupled. Therefore ions that cause an action potential in one cell can spread to its adjacent cell to initiate an action potential there. Electrical coupling ensures the electrical activity of the heart is synchronised. As cells share cytosol, ions will quickly spread by passive diffusion down a large electrochemical gradient. This almost instantaneously evokes an action potential in the next cell. Gap junctions ensure a unidirectional spread of the action potential. Fig 1 – Diagram showing the overall structure of cardiac muscle and highlighting the position of gap junctions. 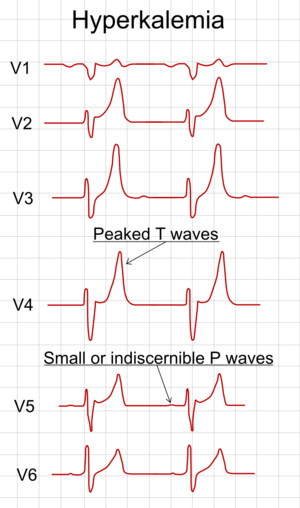 The ventricular action potential is generally split into 5 phases (phases 0-4). Rather confusingly, phase 4 is the baseline that the membrane potential begins and ends at. Like any action potential, each phase is driven by the opening and closing of a variety of specific ion channels. This is because opening an ion channel will push the membrane potential closer to the equilibrium potential of the ions it conducts. This is a great way of controlling the membrane potential in a predictable manner. The main channels responsible for each phase and how they affect the membrane potential will be explored here. K+ currents are the main determinant of the resting membrane potential as the membrane is far more permeable to K+ than any other ion. At rest K+ channels are open, therefore resting membrane potential tends towards the equilibrium potential for K+ (EK). Voltage gated Na+ channels open in response to depolarisation that spreads into the cell through gap junctions. The influx of Na+ ions depolarises the cell further causing the opening of more Na+ channels. This continues in a positive feedback mechanism to cause a fast and steep depolarisation. The Na+ channels become inactivated almost immediately after opening. It is not possible for them to open while in this inactivated state. These channels can only recover from inactivation to enter the closed state at very negative membrane potentials. This means that as long as the myocyte is depolarised, these Na+ channels will not be able to open and cannot induce another action potential in that cell. These transient opening K+ channels rapidly repolarise the cell before the plateau phase. Therefore they set the membrane potential of the plateau phase. Greater K+ currents during this notch phase allows more repolarisation so that the plateau occurs at lower voltages. Fewer K+ currents means that less repolarisation occurs and the plateau phase occurs at higher voltages. L-type Ca2+ channels are located in the T-tubules that penetrate the cell. These channels are in close proximity to the sarcoplasmic reticulum (SR). Therefore the Ca2+ that enters through them binds to ryanodine receptors located on the SR. This triggers massive Ca2+ release from the SR through a channel in the ryanodine receptor. This phenomenon is called calcium induced calcium release (CICR). The majority (75%) of Ca2+ that enters the cell comes from the SR. CICR is essential for excitation-contraction coupling within the cell. Calcium ions bind to troponin C and initiate the movement of tropomyosin away from the myosin head binding site on the actin molecule – permitting contraction. N.B. this method of calcium release is different in skeletal muscle. Fig 2 – Diagram showing phases of the ventricular action potential, with the main ion movements highlighted. As Ca2+ channels close, K+ currents succeed in repolarising the cell, driving the membrane potential toward EK. During this phase Na+ channels will begin to recover from inactivation as the membrane potential becomes more negative. This permits the cycle to restart. In hyperkalaemia, initially the raised extracellular K+ makes the environment outside the cell more positive. This increases the driving force for Na+ entry during fast depolarisation as it is repelled by the positive charges on K+. The extra K+ outside also increases the driving force for K+ entry during repolarisation. This makes repolarisation happen quicker. This may cause tachycardia in the short term. Eventually the cell will re-equilibrate moving closer to the new EK. As hyperkalaemia makes EK less negative, this moves the membrane potential closer to threshold. At these depolarised potentials voltage gated Na+ channels become inactive. This means fewer Na+ channels are available to participate in action potential generation. Action potentials are less likely to occur under these conditions causing bradycardia in the long term. 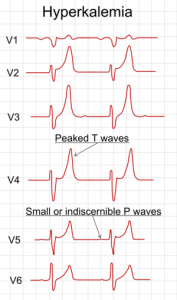 Fig 3 – ECG showing the changes found in hyperkalaemia. In hypokalaemia, initially the lower extracellular K+ reduces the driving for for Na+ entry in fast depolarisation as there are fewer positive charges outside the cell. Less K+ outside the cell also reduces the driving force for K+ entry during repolarisation. This makes repolarisation take longer. This causes bradycardia in the short term. Eventually the cell will re-equilibrate moving closer to the new EK. Hypokalaemia makes the EK more negative so this moves the membrane potential further from threshold. At these hyperpolarised potentials fewer voltage gated Na+ channels are inactive. This means more Na+ channels are available to participate in action potential generation. Action potentials are more likely to occur under these conditions causing tachycardia in the long term. What is the main role of gap junctions between cardiac myocytes? Which phase represents the baseline membrane potential in ventricular myocytes? The resting membrane potential of the cardiac myocyte is produced by the movement of which ion? The movement of which ion is responsible for the notch (phase 1) of the action potential (AP) in ventricular myocytes? Which ions oppose each other to maintain the plateau (phase 2) of the action potential (AP) in ventricular myocytes?